Amman, the capital of Jordan, is a fascinating city with a unique blend of old and new. Ideally situated on a hilly area between the desert and the fertile Jordan Valley. The ancient city features ultra-modern buildings, hotels, smart restaurants, art galleries and boutiques. There is evidence everywhere of the city`s much older past. Citadel Hill, Hercules Hand, The Roman Amphitheater, Jordan Museum, The Children`s Museum Jordan, Al Hussein Park, The Royal Automobile Museum, King Abdullah Mosque, Jabal Amman and so much more! Petra the Rose Red City, the world wonder, and a UNESCO World Heritage Site is without doubt Jordan's most valuable treasure and greatest tourist attraction. It is a vast, unique city, carved into the sheer rock face by the Nabataeans, an industrious Arab people who settled here more than 2000 years ago, turning it into an important junction for the silk, spice and other trade routes. The Treasury is just the first of the many wonders that make up Petra. As you enter the Petra valley you will be overwhelmed by the natural beauty of this place and its outstanding architectural achievements. The Siq, The Treasury, The Royal Tombs, The Monastery, Little Petra, High Place of Sacrifice, The Roman Theatre and so much more! The Dead Sea sits at the lowest point on the earth`s surface at 1,269 ft below sea level bordered by Jordan, Israel, and the West Bank. The Dead Sea has the highest level of salt content of any body of water in the world! Visitors can float freely in these magical healing waters and coat themselves in the mineral packed Dead Sea mud. Some of the world`s most religious sites are located within close proximity to the area and the region is filled with spas that provide rejuvenation and relaxation. Ein Bokek Beach, Mineral Beach, Qumran Caves, Madaba, Masaba, Amman Beach, Ma`in Hot Springs, Ein Gedi Spa, Nahal David Stream and so much more! The sparkling coastal location of Aqaba lies on the northern tip of the glistening Red Sea and is the gateway to the fascinating historic regions of Petra and Wadi Rum. The town offers visitors many ancient attractions including castles, ruins and archeological museums. The Red Sea offers some of the best diving sites in the world filled with some outstanding wreckages and vibrant coral reefs. There is so much to explore in the port city along with excellent cuisine to dine on and an up-scale nightlife on the luxurious marina. Aqaba Castle, Aqaba Flagpole, Aqaba Aqua Marine Park, Aqaba Beaches, Masjid Al Hussein Bin Ali Mosque, Masjid Al Sheikh Zayed mosque, Ayla and much more. The beautiful red-sand desert of Wadi Rum is famous for its striking landscapes filled with natural arches, massive mountains and incredible rock formations decorated with ancient inscriptions and petroglyphs, dating back thousands of year. The quintessential desert offers visitors an exciting glimpse of the desert life of the Bedouin families and their deep history. 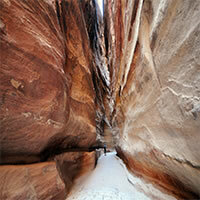 Wadi Rum is the crown jewel of Jordan and one of the world`s most beautiful deserts. A remote land brimming with activities, adventure and awe-inspiring sunsets, an unforgettable trip. Lawrence`s Springs, Lawrence`s House, Khazali Canyon, Mushroom Rock, Seven Pillars of Wisdom, Burdah Rock Bridge, Alameleh Inscriptions, Jabal Rum Mountain and so much more. 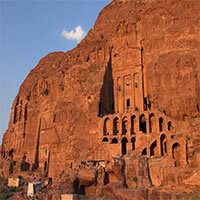 The awe-inspiring Ancient City of Petra is the country`s most valuable treasure. The UNESCO World Heritage Site and one of the Seven Wonders of the Modern World is a unique, vast city carved into the sheer sandstone rocks is an amazing place to explore. Discover massive ancient temples and tombs along with the spectacular sights from the Mountaintop Monarchy in a city that dates back over 2,000 years. Be a witness of history! Go to Petra, one of the world's most famous historical archeological sites and admire colorful and strange rock formations. Then get benefit from the healing properties of the Dead Sea, enjoy health tourism and relaxation combined with history. Then escape to ancient times in Cairo, visit The Pyramids, Sphinx and Egyptian Museums. Finally fly to Istanbul, a city with millions of flavors and aromas, over 2500 years of history, beautiful landmarks and breathtaking views. Do not forget to try the Perfect Mix of Eastern and Western Food. This is a flexible package with daily departures from anywhere in the USA or Canada. Choose your lenght of stay. Pick your own flights, hotels and activities. Add, remove or reorder cities. Middle East Jewels!... Fly into Jordan and visit Amman, a city with a singular and bustling labyrinthine 'downtown’, where you can see their imposing Roman Theatre as well; definitely a must see while on this city. Then comes Petra, Jordan's most valuable treasure and greatest tourist attraction, also known as the Rose-Red city due to the color of the stone out of which it is carved. Up next is Dead Sea or the'Salt Sea', a truly one of Earth's unique places. Last but not least is Cairo, where you can explore their breathtaking and world famous Pyramids, visit the capital's medieval markets by Khan El-Khalili, or walk down the Nile promenade, an unforgettable trip indeed! Enjoy The Wonders of the Holy Land! Flight to Tel Aviv, one of the coolest cities in the world. Famous for its stylish buildings, beautiful beaches, 24-hour life style and delicious food. Up next visit one of the most wonderful and spirituall cities in the world, Jerusalem where every stone tells a story of a town that has drawn millions of faithful pilgrims for thousands of years. Then escape to Amman, a city with a singular and bustling labyrinthine "downtown", where you can see their imposing Roman Theatre; definitely a must see while on this city. Finally go to Petra, 'the rose city', famous for its multicolored sandstone and genuine Nabatean architecture, definitely one of the most renowned archaeological treasures in the world. Unforgettable vacation experience! 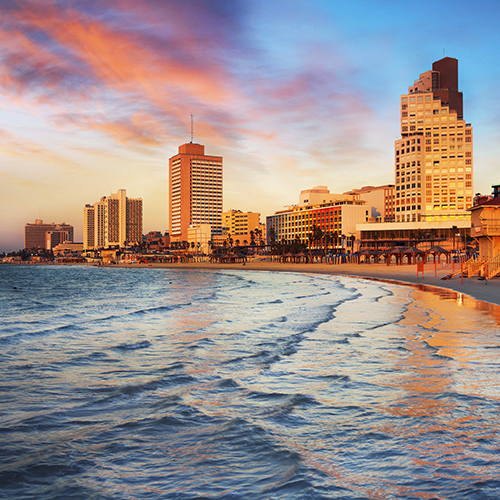 Visit the fascinating cities of Tel Aviv, often called 'the city that never stops', was the first modern Jewish city built in Israel, and is the country's economic and cultural center. Then escape to Jerusalem, Holy to Jews, Christians and Muslims, Jerusalem's Old City is one of the world's foremost pilgrimage destinations. Then comes Amman, a city with a singular and bustling labyrinthine 'downtown’, where you can see their imposing Roman Theatre; definitely a must see while on this city. 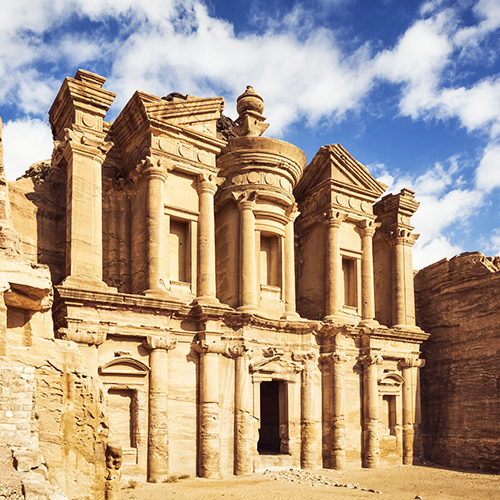 Up next go to Petra, The "Lost City", one of the most famous archaeological sites in the world. Lastly is Dead Sea, the salty lake located at the lowest point on Earth, is gradually shrinking under the heat of the Middle Eastern sun. Unforgettable adventure. History and charm! Fly into Jordan and visit Amman, a city with a singular and bustling labyrinthine 'downtown’, where you can see their imposing Roman Theatre as well; definitely a must see while on this city. Up next get benefit from the healing properties of the Dead Sea, enjoy health tourism and relaxation combined with history. Then escape to Petra, 'the rose city', famous for its multicolored sandstone and genuine Nabatean architecture, one of the most renowned archaeological treasures in the world. Lastly, visit Aqaba, the gateway city to the famous desert landscapes of Wadi Rum, enjoy its inviting rich marine life in the warm Red Sea waters. A land of Religious Harmony! First, we land in Cairo, Egypt’s sprawling capital, where at its heart is Tahrir Square and the vast Egyptian Museum. Then we reach Amman where centuries of history are perched atop Jebel al-Qala'a, Amman's highest hill, where ancient Roman, Byzantine, and Umayyad ruins make up the area known as The Citadel. Next we reach Dead Sea where you could find The caves of Qumran and Wadi David, that is one of the two valleys that incorporate En Gedi Nature Park. Then comes Petra, the famous archaeological site in Jordan's southwestern desert, also called 'The rose city' is the home of Al Khazneh, a temple with an ornate, Greek-style facade, and known as The Treasury. Lastly we have Wadi Rum, also known as the Valley of the Moon, where you can see the Khaz'ali Canyon (Siq al-Khazali) and this narrow canyon contains numerous Nabataean rock carvings of people and animals. Beautiful! Marvelous Holy Land! You will land in Tel Aviv, often called 'the city that never stops', was the first modern Jewish city built in Israel, and is the country's economic and cultural center. Then escape to Jerusalem, Holy to Jews, Christians and Muslims, Jerusalem's Old City is one of the world's foremost pilgrimage destinations. Then visit Tiberias, offering plenty of water sports and biblical walks. Visitors can sail the Sea of Galilee; while spas maintain a 2,000-year-old tradition. Then comes Petra, Jordan's most valuable treasure and greatest tourist attraction, also known as the Rose-Red city due to the color of the stone out of which it is carved. Last but not least is Amman, a city with a singular and bustling labyrinthine downtown, where you can see their imposing Roman Theatre as well; definitely a must see while on this city. Amazing getaway! Fly into Jordan and visit Amman, a city with a singular and bustling labyrinthine 'downtown’, where you can see their imposing Roman Theatre as well; definitely a must see while on this city. Then escape to Petra, 'the rose city', famous for its multicolored sandstone and genuine Nabatean architecture, definitely one of the most renowned archaeological treasures in the world. Lastly, go to Aqaba, the gateway city to the famous desert landscapes of Wadi Rum, enjoy its inviting rich marine life in the warm Red Sea waters. Jordan in all its Glory! Land into Jordan and visit Amman, a city with a singular and bustling labyrinthine 'downtown’, where you can see their imposing Roman Theatre as well; definitely a must see while on this city. Next stop is Petra, 'The rose city', famous for its multicolored sandstone and genuine Nabatean architecture, one of the most renowned archaeological treasures in the world. Then comes Wadi Rum, also known as the Valley of the Moon, where you can see the Khaz'ali Canyon (Siq al-Khazali), this narrow canyon contains numerous Nabataean rock carvings of people and animals. Beautiful! Then escape to Aqaba, the port city on the Red Sea's Gulf and home to the Islamic-era Aqaba Fort and the adjacent Aqaba Archaeological Museum. Jordan, an Arab Nation Wonder! First stop is Amman, home of the National Art Gallery and the Roman Theatre as well! 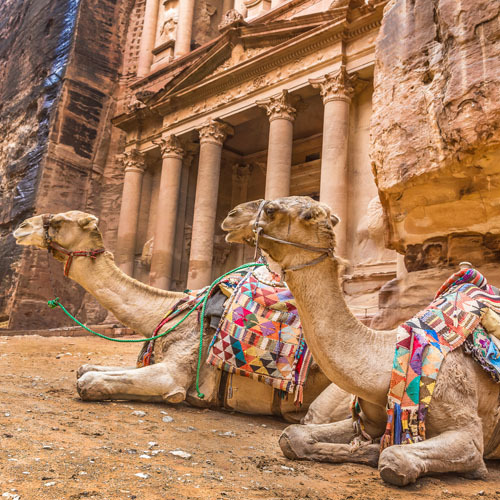 Up next is Petra, 'The rose city', famous for its multicolored sandstone and genuine Nabatean architecture, one of the most renowned archaeological treasures in the world. Next we have Wadi Rum, also known as the Valley of the Moon, where you can see the Red Sand Dunes (Umm Ishrin) and the Seven Pillars of Wisdom; although most people can only count five. Last but not least is Dead Sea where you could find The caves of Qumran, one of the greatest religious discoveries of modern times where the Dead Sea Scrolls were discovered, they are the oldest surviving manuscripts of the Bible. Luxury and Archeological Adventure! We reach the vibrant and luxurious city of Dubai; where you can visit Burj Khalifa, the tallest building in the world, or hit town and visit some of the many Mosques and be blown away by the luxury and architecture this city is known for. Then we head up to Amman, home of the Roman Theatre which it dates back to the Roman period when the city was known as Philadelphia. Next stop is Dead Sea where you could find The caves of Qumran, one of the greatest religious discoveries of modern times where the Dead Sea Scrolls were discovered! 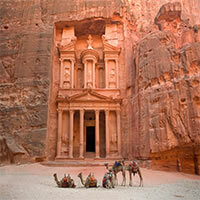 Up next is Up next is Petra, 'The rose city', famous for its multicolored sandstone and genuine Nabatean architecture. And lastly we reach Wadi Rum, also known as the Valley of the Moon, where you can see the Red Sand Dunes (Umm Ishrin) and the Seven Pillars of Wisdom. The best that Middle East has to Offer! Fly into the marvelous city of Tel Aviv, often called 'the city that never stops', and enjoy its culture, art, festivals, and a vibrant night life. Nex Stop is Amman, home of the National Art Gallery and the Roman Theatre as well! Then comes Petra, the famous archaeological site in Jordan's southwestern desert, also called 'The rose city' is the home of Al Khazneh, a temple with an ornate, Greek-style facade, and known as The Treasury. Last but not least is Aqaba, the port city on the Red Sea's Gulf and home to the Islamic-era Aqaba Fort and the adjacent Aqaba Archaeological Museum. Continue with providing your customers with the best service, finding reliable and efficient tour groups and companies.